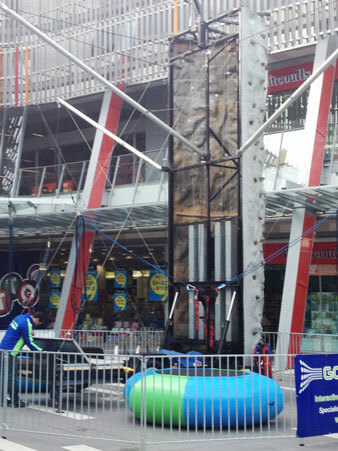 The Bungy Combo consists of 2 bungy trampolines and 4 fully automated Climbing Wall routes of varying degrees of difficulty (suitable for weights of between 20 to 100kgs). It can accommodate up to 4 climbers at a time, with two Bungy Trampolines mounted to the back of the Wall suitable for weights of between 10 to 80kg. It is very popular as it gives 2 alternative activities to choose from with up to 6 people at a time using both activities. With the help of the elastic loops connected to the harness, the jumper can reach heights in excess of 8 metres! The Bungy is a guaranteed physical and mental challenge, the participant has to actively jump, whilst overcoming the mental challenge that comes with defying gravity and perhaps even performing somersaults! The Climbing Wall utilises fail-safe, auto-belay technology, meaning the climber can focus on the challenge of climbing up the wall and the fun of abseiling down. The climbing routes are completely customisable and have been mapped out by us to provide an increased gradient of difficulty and challenges associated with the progression from climb to climb.